How Product Cost Management and Featured Based Cost Estimating software works..
How Featured Based Product Cost Estimating software works..
A working solid CAD model is processed by a Geometry Assesssment engine and Geometric Cost Drivers (GCD's) determined. Based on user determined criteria, defined in the VMU's, the routing engine produces one or more candidate process routings for the user to select or compare. The estimated cost results are presented to the user in real time. Materials and raw stock available to the unit. VMU's can represent internal, off-shore or supplier facilities. 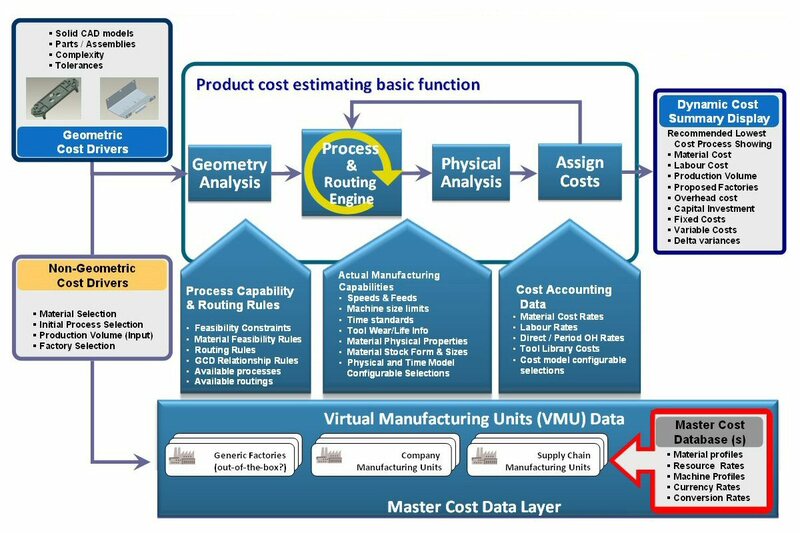 VMU's are usually configured from a master cost database either by the user or via a consulting service.